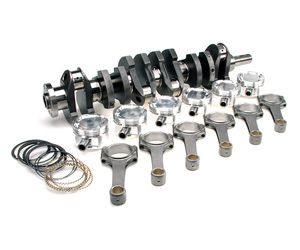 The BC stroker kit for the Nissan Patrol TB48 engine platform incorporates a 108mm r 110mmstroke, steel billet crank, BC 4340 Pro Series or aluminum connecting rods rated to 1600+ horsepower. Depending on bore size that you decide, the BC kit will take you up to a 5.15L with 100.5mm bore. As usual, each BC kit features custom CP aluminum forged pistons, 9310 alloy wrist pins, ring pack and buttons. Available in any desired bore and compression ratio for use in turbo or normally aspirated. BC 4340 forged steel crankshaft (108mm or 110mm stroke). BC 4340 I-Beam Pro Series connecting rods w/ARP 220,000 psi fasteners or custom aluminum connecting rods w/ARP fasteners. 9310 Series upgraded wrist pins standard.